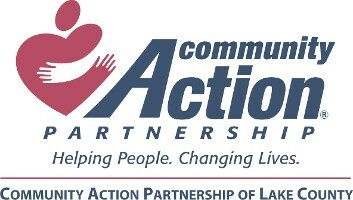 Community Action Partnership of Lake County serves Lake County, Illinois, with various programs to help local families find self-sufficiency. Learn more about how our programs help children and families in need. Low Income Home Energy Assistance Program (LIHEAP) and the Percentage of Income Payment Plan (PIPP) programs opened October 1, 2018. PIPP applications will be taken until December 31, 2018, or until funding is exhausted. LIHEAP will end May 31, 2019 or when funds are exhausted. The priority period for households with a Senior (age 60 or older) or households with someone receiving disability begins October 1, 2018. Beginning November 1, 2018 families with children age 5 or under (includes all children who are not yet 6 years old, that is, up to 5 years and 364 days) and households whose service is in Imminent Disconnect or has been disconnected may apply. December 1, 2018 all income eligible households, including those under imminent threat of disconnection may apply. All applicants must schedule an appointment by calling 847-249-4330. Applications are taken on a first-come, first-served basis. To qualify, households must have income equal to or less than 150% of the poverty level. For example: A single-person household can qualify with a gross monthly income of up to $1,518, twoperson household $2,058, three-person household $2,598 and four-person household $3,138. Documentation required at application is a photo ID, proof of income for the 30-days prior to the appointment, Social Security cards for all household members, and a current utility bill. If your household is LIHEAP eligible and your heating system is inoperable or determined to be unsafe by the fuel vendor, Furnace Assistance may be available. Call 847-249-4330 for an appointment. The Illinois Home Weatherization Assistance Program (IHWAP) makes homes of lowincome families more energy efficient by reducing the amount of energy it takes to keep homes warm in winter and cool in summer. An extensive array of conservation actions and improvements are funded through the program. The first step of the process is an energy audit that will be performed. The results of the audit will be used to determine the types of improvements that will be made to the home. Updates to the residence include attic and wall insulation, air sealing, window and door weatherization, and furnace repair and replacement. The work will be completed by local contractors or work crews that are specifically trained to install weatherization measures, and an inspection will be done upon completion. To apply for IHWAP, call Community Action Partnership of Lake County at 847-249-4330 to schedule an appointment. IHWAP applications can be completed at the same time as a LIHEAP application. However, in some instances, income eligibility may be higher for weatherization projects. 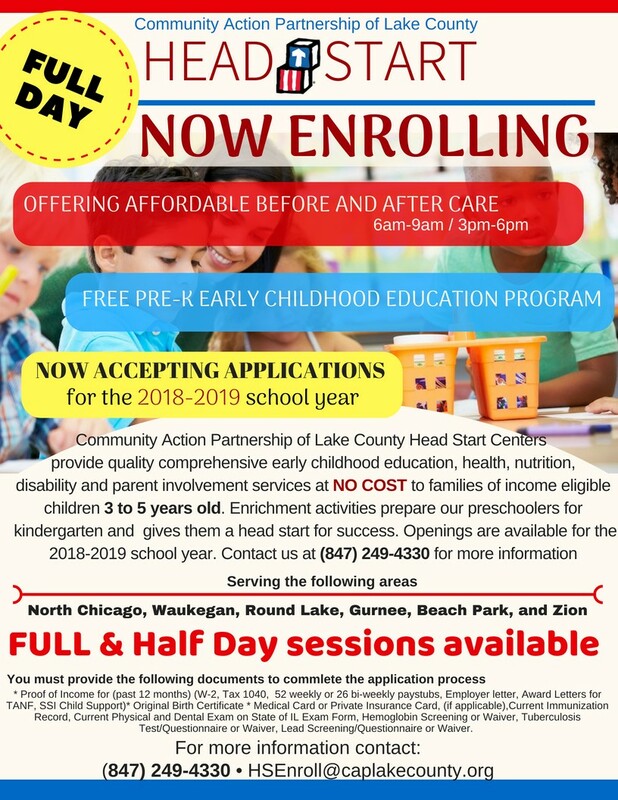 Head Start is a program that provides comprehensive early childhood education, health, nutrition, disability, and parent involvement services to low-income children ages three to five and their families. The federally funded program creates an atmosphere where children from low-income families can go and experience a new environment. Learn more about the specifics of how this program offers early childhood education, health and nutrition services, and parent, family, and community engagement. Enroll your preschooler in a full-day program. Or, extend your child's Head Start or School District day. Before and After school childcare and enrichment activities are available for children ages 5-6 years weekdays from 6:30 am until 6:30 pm. Adventure Kids is located at 1906 Sherman Ave. in North Chicago and follows the Lake County, IL public school calendar for vacation days. 2018 school year Adventure Kids enrollment is open now: Call 847/249-4330 for details. Lake County individuals and families may be eligible for one-time financial assistance if they are income eligible and can verify 90-day income and Lake County residency. Case management may be required. Call 847/249-4330 for an appointment. Funded by CSBG. Post-secondary scholarships are available annually until funds are exhausted. Students are awarded scholarship for costs associated with attending accredited Illinois institutions of higher education or vocational training schools. Eligibility requirements. Funded by CSBG. Kids Club is an affordable 7-week Summer Day Camp that offers youth 5 - 12 years fun-filled activities and field trips each summer in the Waukegan, IL area. Extended hours are available for working parents. Scholarships are available through CSBG. Through this program, we offer safe and affordable housing for rent and first-time homeownership. CAPOLC also operates affordable housing to help veterans. CAPOLC owns 37 affordable rental housing units, a 14-unit apartment complex in Antioch, and four lease-to-own single-family houses in Lake County, Illinois.